National Poetry Month was inspired by the success of Black History Month, held each February, and Women’s History Month, held in March. Neglecting for the moment that conflating poetry, as a genre, to either race or gender seems a little, well, off, celebrating poetry seems like a great idea. Perhaps due to its brevity or the fact that quality within it varies so greatly and is arguably so subjective, poetry is a difficult beast. Lots of people write it with varying degrees of success. I love poetry. Poetry requires a compression of both words and imagery that help me flex muscles of concision and precision that I might otherwise eschew, and that’s not even to mention an attention to detail and to rhythm that can elevate both style and prose. Still, poetry gives me a chance to try new things in new ways, make choices I might not even consider in writing a longer work–mainly because that’s when I follow story and plot more closely. Everything in service to what happens next. So in that spirit, and in the spirt of National Poetry Month, I’m publishing a new micro-collection of four poems on the first four Mondays during April–and then finishing the month with a collection of flash-fiction prose poems (one of which is more a very short story). And even better, each one will begin its life free for Kindle. 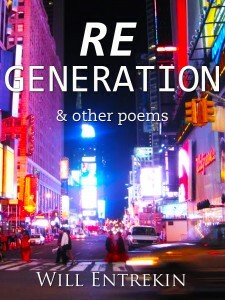 Up first is this “ReGeneration & other poems,” which includes one that was included in my collection, one that was posted on this site, and two that have never ever been seen before. Coming Monday. To any screen you choose, via Amazon’s amazing Kindle platform! Are We All Best Sellers Now?